HIV/AIDS is a global scourge. According to UNAIDS, the Joint United Nations Programme on HIV/AIDS, an estimated 33.2 million people are infected with the human immunodeficiency virus. The countries of sub-Saharan Africa, however, bear a disproportionately high burden: although SSA has slightly more than 10 per cent of the world’s population, it is home to an estimated 68 per cent of all people infected with HIV; the mortality rate is even more unbalanced, with the region claiming some three-quarters of all AIDS-related deaths. 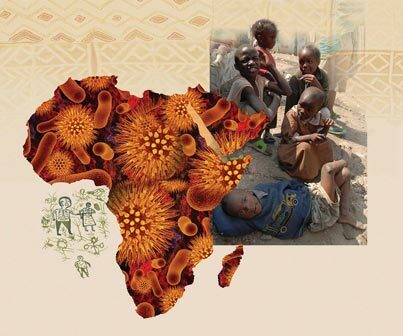 Between 20.9 and 24.3 million people are living with HIV in SSA, and an additional 1.4 to 2.4 million people were newly infected with the virus in 2007 alone. Africa does not have an AIDS epidemic—it has many, and they vary in intensity from country to country, from region to region. Some of these epidemics, particularly in the southernmost countries, are exploding. Others are in decline, evidence of a gradual, but no less significant, turning of the tide. Uganda, for example, initiated effective prevention efforts (such as campaigns to promote condom use) specific to local cultural contexts, contributing to a recent drop in adult national HIV prevalence. In laboratories, researchers have created better, simpler antiretroviral treatment regimens now able to keep a person with HIV healthy for decades—and these drugs are slowly (much too slowly, many would argue) becoming more affordable and available. Without a doubt, there is much work to be done, and the challenges are great. But, where there was once only suffering, there is now also hope. The following pages profile seven of McGill’s many HIV/AIDS researchers who are working with African colleagues to reduce risk, decrease vulnerability and lower the impact of this most harrowing disease.